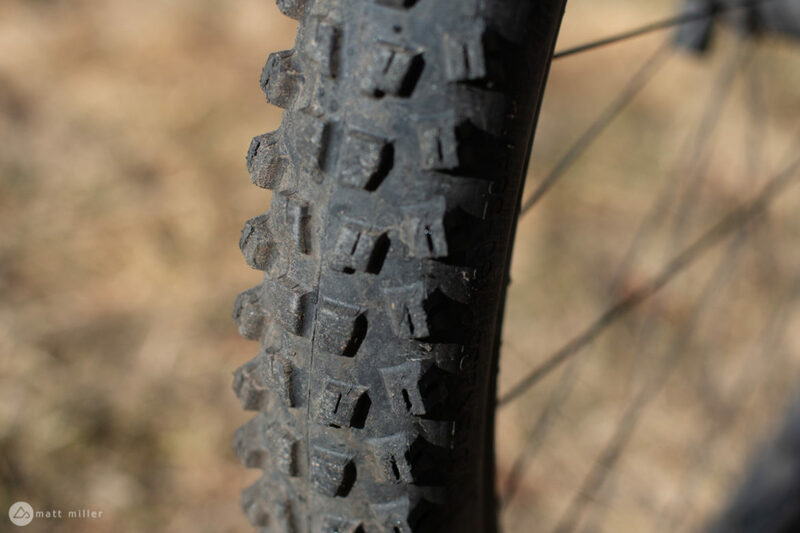 Earlier this year, I checked out the Vee Snap WCE downhill tires. They were in the prototyping phase then, bearing the ‘Vee Factory Ride’ logo, rather than ‘Snap WCE’ label, though that was the only difference. The Snap WCEs are a heavier and sticker version with slightly different knob spacing than the Flow Snaps. 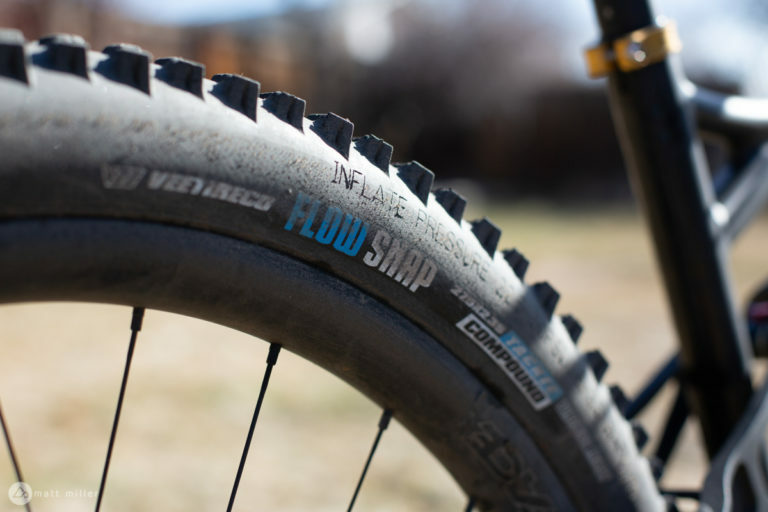 The Flow Snaps roll a bit faster and are lighter, which makes them a great option from Vee for a trail, enduro, or all-mountain tire. I was a little worried when the package arrived with two 2.35-inch tires inside. I’ve always run a slightly fatter tire up front, but thought “What the heck. Might as well try it,” and mounted them both up on my trail bike. 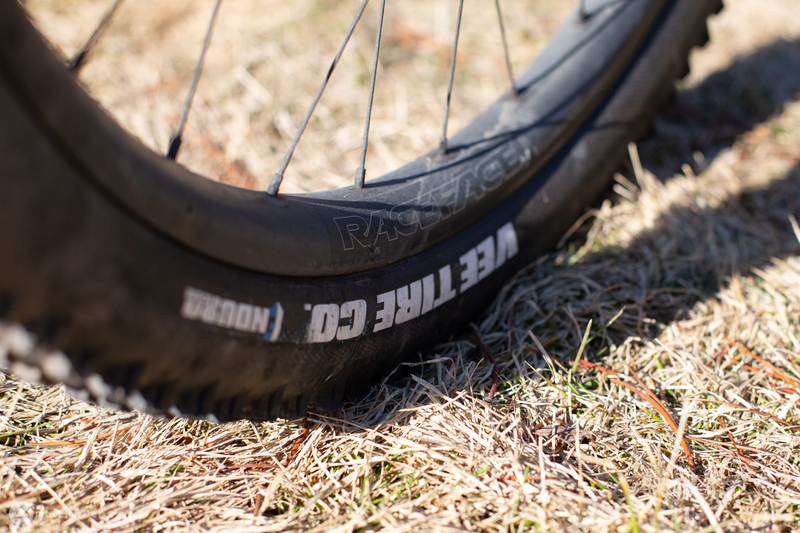 The tires spread out pretty wide on my 31mm internal width rims, so it didn’t seem like it would be a problem, and throughout my testing, running both of the 2.35″ tires front and back went just fine. It’s nice to see a set of quality tires like the Vee Flow Snap sell for a lower price than many competitors on the market. 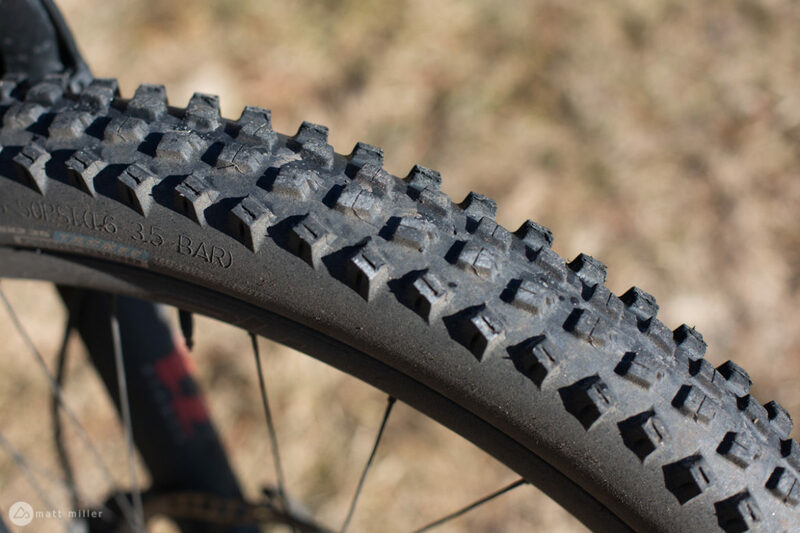 The tires are probably $20-$30 less than a lot of other brands out there, but the question is, are they worth the savings? The center knobs on the Flow Snap are stiff and roll quite fast. This was a pleasant change from the Snap WCEs I tested before this which were sticky as a slug in maple syrup. The Flow Snaps pedaled nicely for a trail and enduro tire and I didn’t feel like I had to really push the pedals down to get them to spin. Of course, the Flow Snap is heavier than other competing tires and riders will have to spin a little more rotational weight. 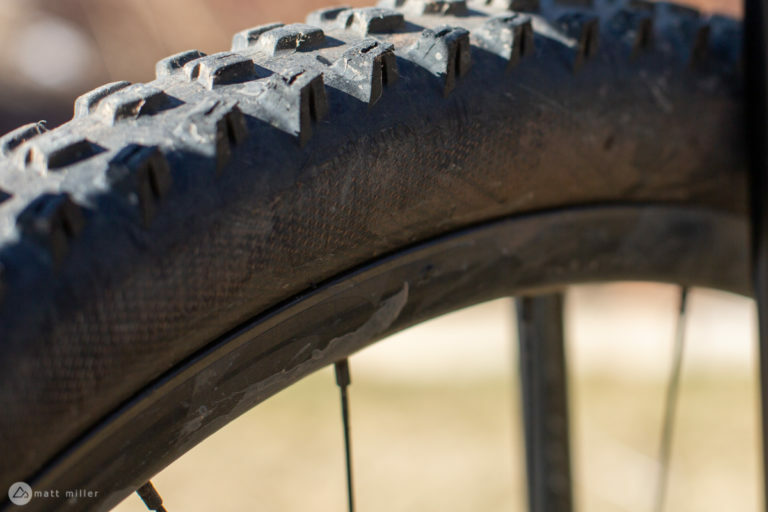 Like the Snap WCE and other Vee tires, the Flow Snap uses a Synthesis sidewall, which is a red threaded, woven Aramid pattern for tougher sidewall protection. On both tires, the Flow Snap and Snap WCE, I felt like the threading really gave the tires a supple ride quality. Vee must have done something right with Synthesis. I ran the tires on two different bikes in Moab on two different occasions, and smashed them into square rocks both times, which resulted in that concerning sound of carbon-on-sandstone impact. Fortunately the tires didn’t puncture or snake bite either time. Cornering on the tires was seamless too. They offer plenty of bite on hardpack, and loose-over-hard conditions. On softer terrain though, they struggled a few times to dig in, which is my main complaint about the tire. When things get a little wet, the tire gets a little squirrely. This wasn’t the case on the Snap WCE, probably because of the slightly wider knob spacing and very sticky compound. The Flow Snap’s performance in wet conditions just isn’t as great. The tires also seem to wear rather quickly. I didn’t start riding them until December and haven’t ridden that much over the winter (damn you, Colorado), yet the knobs have worn rather quickly. The cornering knobs are looking a little chewed up at this point, especially on the inside of the knob. The center knobs still probably have plenty of life. There’s some rounding to them, but I’m sure they’ll roll fine for a little longer. Granted I rode the tires in Moab which chews tires up, but they haven’t seen a ton of miles outside of that. Oddly, the Snap WCEs, which are way stickier, seem to have lasted longer. Aside from the wet performance and wear rate of the Flow Snap, I’ve enjoyed my time on them. 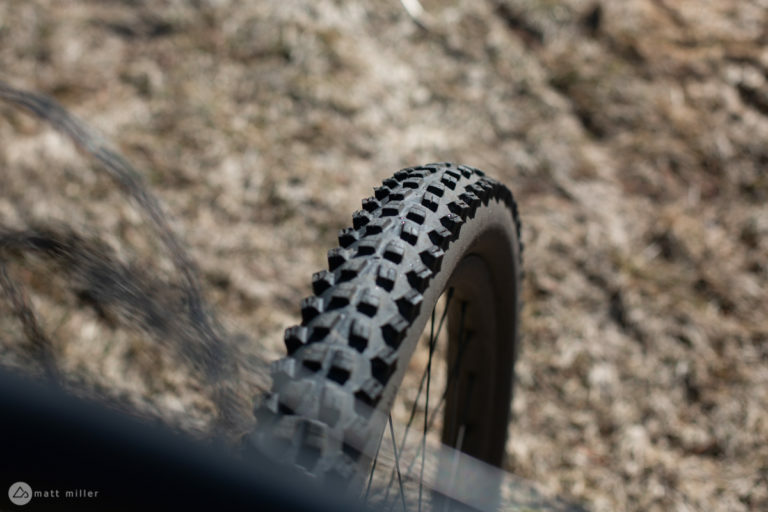 They’re slightly heavier than competing tires, but they perform well in the right conditions and hold up to rock smashing; and durability is my most important consideration for a tire. They work just fine as a front and rear combo and hold up great for aggressive riding.